probably realize that there are a number of plow systems on the market for ATVs. These systems perform the operation of lifting, lowering and angling with three different systems: the manual system (all manpower done via levers or long handles), the winch system, and the hydraulic system. Simply stated, speed, simplicity and efficiency are the greatest strengths of the Hydraulic ATV snow plow system. No winch means no slack lines to tangle or corrode, no pulleys to fail, and all operations of the plow are performed right from the handle bar-mounted control box, including the two most important functions, lifting and left/right power angling. Keeping the ATV operator on the seat of the ATV at all times equates to much safer operation. It also greatly reduces operator fatigue over time and increase the efficiency of the operator. The Hydraulic system also makes it possible for a contractor grade snow plow to be used on the ATV for snow removal operations. This heavy-duty construction keeps the plow functioning, with fewer breakdowns, for many years making it an excellent investment for the professional snow removal contractor. Hydraulic systems do tend to have a slightly higher price tag than winch powered systems, but the trade-offs for power angling and simplicity make that higher price worth it in most contractor’s minds. Power angling left and right with the handle-bar controls. Faster lifting and angling – no slack in lines. Operator Stays Put! No need to get off the ATV to change the plow angle. Lower amp draw. If you hold the “raise” button too long, the motor shuts off saving wear and tear on the motor and the winch line. Quick attach system. Makes taking the plow on and off the ATV simple. Handlebar mounted control box. Every crucial operation of the ATV snow plow is at your fingertips! 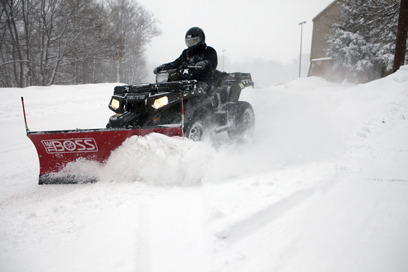 Because many ATVs sold today are outfitted with winch systems, many contractors consider their use for snow removal operations. Winch Systems do allow the operator to power raise and lower the ATV snow plow, which is much easier than manual systems. They also tend to be slightly less in price than Hydraulic ATV snowplow systems. The greatest weakness of a winch-powered system is the cable or line that is used to connect the motor and the plow. This cable is subjected to a number of different conditions that can severely impact its durability and functionality. Over the course of a snowplowing event, water and ice can cause the line to freeze up inside the spool of the winch system, rendering it useless. The cable is also subjected to salt and other corrosive elements which can cause rust and eventually, failure. Frequent lifting and lowering of the plow can create slack in the line, which can also cause tangling in the spool and eventually a failure to operate. We’ve included some tips for overcoming some of these problems below. Another item to consider: If the operator of the winch plow system takes the plow all the way to the top lift position and continues to hold the up button on the controller too long, a damaging current spike can occur – sometimes over 200 amps! This is a large strain on your electrical system and battery – and ATV batteries are expensive. Again, we’ve included some tips for overcoming this issue at the bottom of this blog. Generally lower priced than Hydraulic ATV snow plow systems. Most ATVs already have winches on them. Use a short synthetic rope (No metal burrs). This reduces wear on your good winch cable or rope. It also reduces the risk of your cable/rope getting tangled. Only lift the plow up to clear the obstacle or back up, but don’t continually run it against the maximum heights stops. Continually lifting to the stops stresses both the rope and the winch. For both systems make sure you have a strong battery that holds a good charge to maximize snow plow operation.